Meet Jordan Becker of the University of Minnesota, Twin Cities. Jordan recently joined Reuben Harris’ lab as a postdoc after earning his PhD from the University of Wisconsin-Madison last October. He received the Uta von Schwedler Prize last year and returned again this year – his third, consecutive Retroviruses meeting – to present a talk titled "Subcellular distribution of APOBEC3 proteins regulate interactions with and restriction of HIV-1". Viruses are the world's best cellular biologists: they are amazing at learning how to manipulate their hosts. Much in that way, I'm a cellular biologist who has used viruses to understand how cells function and how viruses hijack, avoid, or remove cellular factors. More specifically, I study viral RNA trafficking, interactions with cellular RNA-binding proteins, and how a family of nucleic acid mutating enzymes (APOBEC3 proteins) lead to viral mutation and evolution. I completed my PhD with Nathan Sherer and became adept at fluorescence microscopy to, literally, observe how fluorescent versions of viral and cellular proteins and RNAs move in cells. As the saying goes, “a picture is worth a thousand words” and seeing where things are in cells and how viruses can mess that up are powerful. However, being able to quantify those images and support my observations with traditional biochemical methods (e.g. blots, PCR, infectivity assays) is even more powerful. To be fair I like the way I study RNA trafficking just as much as the field and results themselves. Prior to beginning my PhD, I worked first as an undergraduate researcher then as a technician in a cancer immunology lab with Douglas McNeel. I processed blood samples and performed functional immune assays from clinical trials in prostate cancer patients. I enjoyed working with translational/clinical samples that could inform patient health as well as tell us about cancer immunology. More than that, I really learned to love the academic environment with great graduate students, postdocs, fellows, and my first mentor Doug. His lab was a place where happy people thought about interesting ideas; and as I've worked in other labs, I have always found broad curiosity and interesting/creative ideas to be one of the most important features of a lab! That was the case with Nate Sherer and my graduate lab coworkers, and it continues in my new lab with Reuben Harris. Was there something specific about the Retroviruses meeting that drew you to attend? The retrovirus community is intense but also quite friendly. The CSHL Retroviruses meeting is an amazing venue to both incite and settle controversies – some again and again. Science is iterative and by knowing the history of the field and returning to interesting ideas we can gain insight into what has been done right and what can be done better. For me, the key takeaway is it’s time to take imaging of HIV RNA trafficking and RNA-binding proteins to a new level. There’s definitely an expectation or hope to keep trying new experiments in more relevant cell types and with diverse viral strains. I’ll see how that goes! I really enjoyed the recent fluorescent microscopy performed by the Markus Thali lab using lightsheet microscopy to image HIV-1 lymphocytes over long periods of time, and work by Collin Kieffer using multiscale imaging techniques to look at sites HIV-1 assembly in humanized mice. I'm always excited of new ways to look deeper and see more. Come, bring your data and love for virology (and coffee and beer). The scientists who attend this meeting are all incredibly friendly, creative, brilliant, and always willing to settle disagreements over a beer. This is my third CSHL meeting – all Retroviruses (2016, 2017, and 2018). CSHL is like going to summer camp. You're here, you're not going anywhere else, and you meet amazing new friends. I like to go for walks along the bay or out to the end of Bungtown Road, and have lunch out on the lawn to work on my tan. Thank you to Jordan for being this week's featured visitor. To meet other featured scientists - and discover the wide range of science that takes part in a CSHL meeting or course - go here. Meet Shaima Akhlaq of the UAE University (United Arab Emirates). The graduate student, who defends her thesis this upcoming fall semester, works with Farah Mustafa in the Department of Biochemistry in close collaboration with Tahir Rizvi's research group within the Department of Microbiology and Immunology. She is on campus for the Retroviruses meeting where she presented a poster and a short talk. Read on for more on the CSHL first-timer's experience at the annual meeting. We are studying viral gRNA export from nucleus to cytoplasm, stability, translation and their interplay during retroviral replication. My current research interest lies in answering some of the basic aspects about the life cycle of Mouse Mammary Tumor Virus. The immense learning and connections I have developed are my key takeaways from this meeting. This is my first visit to CSHL and my first CSHL meeting; though my poster was selected for last year’s Retroviruses meeting. Also, I would be very eager to participate in the annual Retroviruses meeting in the upcoming years. My first and foremost attraction was to meet the field specialists and catch up with the latest advancements. I was also excited to share my results with other colleagues in my scheduled talk and poster. And I intend to find a competitive PhD position with an established group participating in this meeting. I would extend my words about this exceptional opportunity of meeting with all field specialists under one roof. The scenic view of this campus is one thing which took my breath away in first sight because flying from a desert to this lush green island is nothing less than a scientific vacation. Thank you to Shaima for being this week's featured visitor. 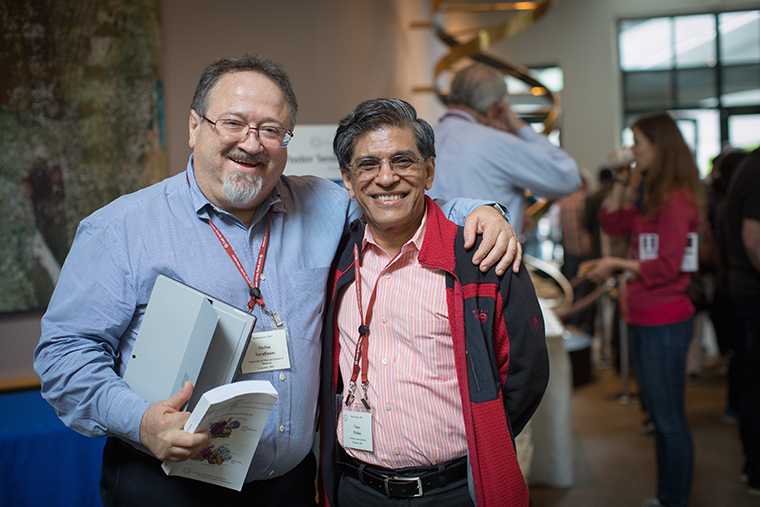 To meet other featured scientists - and discover the wide range of science that takes part in a CSHL meeting or course – go here.